Win-EZ is so intuitive and low maintenance that if you can read you can use it. All sales are kept forever in complete detail and there is no need for an end of day or period. It’s automatic. With Win-EZ Fast Bar, bartenders can do automatic last rounds, select from a list of regulars or enter a tab name and save to the regulars list. Our driver's license interface lets you check the customers age by swiping their license. Credit card names or driver's license names automatically become tab names. 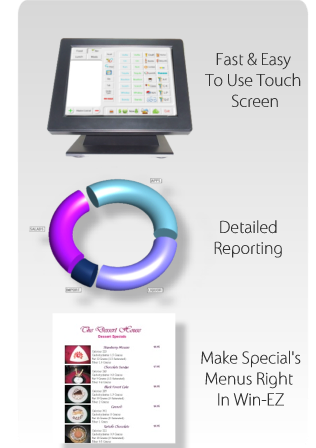 The Win-EZ Cashier System allows two touch transactions. Simply wave the customer's check under the bar code scanner, touch the media and then close. It’s that simple. New cashiers can be trained literally in minutes. Live information is crucial to a restaurant’s profitability. Managers see at a glance the status of all tables in use. Turquoise is Ready. Yellow is In Use and Red means the guest check has been presented. Even get drill down electronic journal right from the table screen.